Jeffrey A. writes: I’m having no success in identifying what I think is an ancient coin. I’m not even sure if it’s real or not. It was among my father’s possessions when he passed away and no one in the family knows anything about it. Please help! 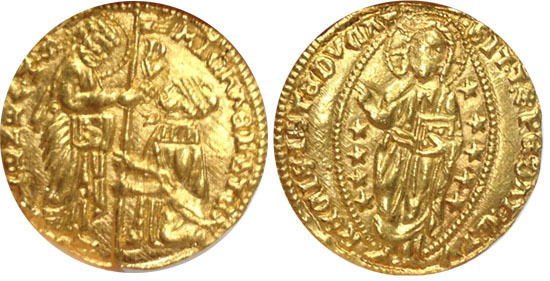 Your coin is a Venetian Ducat, the very first gold coin made by the City State of Venice, and is a very popular Italian coin minted from about 1284 AD under the doge (mayor of the city) Fra Griovanni Dandolo. It shows the doge kneeling before St. Mark on the Obverse, and a figure of Christ standing, on the reverse, in an oval frame accompanied by the inscription Christe datus, quem tu regis, iste ducatus (Christ to give, that duchy, that you rule). The last word of the legend, ducatus (duchy) is the origin of the coin name “Ducat”. The design is perfect political propaganda (who is gonna mess with someone that Christ has blessed? ).